EARTH Day helps create awareness about how environmental issues affect us. One of the biggest challenges we face is the health effects brought by airborne pollution. Every year, the region’s air is choked by haze. The haze created by forest fires in Indonesia last year was one of the worst on record. It was severe enough to extend to Malaysia. The air quality crossed into the hazardous range on the Air Pollutant Index at the height of the haze in Malaysia. The education minister had to close schools in the city and three states due to health concerns. The health effects of air pollution are apparent but less known is the psychological effect it has on our behaviour, and consequently, our performance in the workplace. My colleagues and I studied how air pollution might affect our workplace behaviour through a behavioural theory known as ego depletion — the idea that an individual’s self-control draws upon a limited pool of mental resources, one that can be used up and needs opportunities to restore. Not only does air pollution negatively affect levels of oxygen and glucose in the blood, both of which affect self-control, it can also drain our self-control resources psychologically, causing insomnia, anxiety or depression. Our research examined how pollution affects two kinds of behaviour: organisational citizenship behaviour and counterproductive workplace behaviour. The first behaviour relates to employee actions that contribute to the functioning of the firm, but are optional and not part of their job. These might include individuals’ willingness to be helpful to others, to engage with their team beyond their job scope, or to take action that protects or improves the firm’s image. Some might label it as going above and beyond the call of duty. The second counterproductive behaviour is the flipside of this and includes negative employee actions. These might include working on personal matters during work hours, as well as rudeness, hostility or even bullying of colleagues. A common term for this might be deviance at the workplace. In our research, participants were asked to record daily diary entries rating their perception of pollution levels, their level of mental resource depletion as well as organisational citizenship and counterproductive workplace behaviour. We found a clear link between high air pollution and decreased levels of organisational citizenship behaviour. Likewise, increased pollution also saw a corresponding and marked increase in counterproductive workplace behaviour. Air pollution leads to a decrease in self-control resource, which in turn leads to increased counterproductive and decreased organisational citizenship behaviour. Specifically, the data gathered showed that the severity of air pollution accounted for around 10 per cent of an individual’s daily self-control resource depletion. In other words, by reducing our pool of mental self-control resources, the impact of air pollution makes us less engaged at work and more deviant. Moreover, in line with the ego depletion theory, it is apparent that the direct physiological impact of air pollution and the individual’s own perception of its severity act to deplete resources affecting self-control. Of course, how this manifests itself can vary considerably. 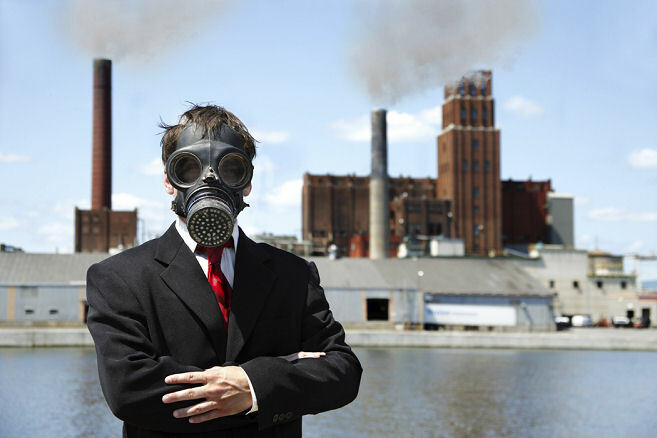 A worker may experience little or no health effects from pollution while another in the same office may suffer badly. Likewise, one individual’s perception of what constitutes “severe” pollution may be different from another. An essential factor in determining an individual’s ability to manage the effects of drained self-control resources is the support they receive, or feel they receive, from those around them. For example, demonstrations of active support from the firm can replenish an employee’s mental resource pool. We found that the negative effects of air pollution on employees’ behaviour were mitigated when organisational support was high, that is when employees perceived that their supervisor or firm was concerned about their wellbeing. In our research, we came across firms tackling the immediate effects of pollution, such as installing more effective air filters in their offices. Similarly, supportive firms might provide additional work breaks or the option to work from home on high pollution days, or they may provide easier and better access to healthcare. While this favours an argument that firms should support employees exposed to severe air pollution, all of this comes with a cost to the firm. By conducting studies like ours, we can better understand the true social and economic implications of pollution and, in turn, add weight to the finan- cial argument for stronger and more effective policies to tackle pollution at source.